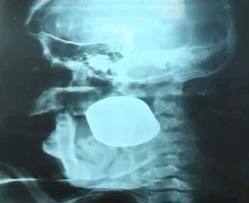 A 32 year old Mexican woman, Karla Flores, survived extraction of a live grenade from between her jawbones. Apparently, she was minding her own business when she was knocked out after something hit her face. Read report here. In the hospital, it was realized that rather than a stone as initially thought, it was a live grenade! Due to fear of it going off, 3 volunteer doctors and one nurse surgically removed the live grenade in an open field under direction of two explosive experts from the military. Due to airway compromise, a trach was first performed prior to extraction. Bear in mind, that the doctor who removed the grenade did not wear any armor. Read more on Fox News here.